TPC Overall Rank: #229 out of 2933 rides. I just love lots of hills on a coaster and that is what it gave me. Rebel Yell was a decent racer. However, one side pulled away after the turnaround on each of my rides. Both ways were pretty rough. Forwards provided some really good air time and backwards had good air as well, but not as much. The ride doesnt look the best though. Rebel Yell is a very fun coaster and the best ride at Paramount that I went on. Running alongside the back of the park, Rebel Yell looks badly in need of a new coat of paint. I have never had a wait for Rebel Yell thanks to its amazing capacity. Now I know Rebel Yell has two different sides, but I only went on the forwards side (still have not and probably wont try the backwards way because it looks way too intense for me). My favorite seat like always is the front. Rebel Yell was very good. The drops were fun and the ride seemed very fast to me. Also, the tunnel at the end is a nice touch. However, I have two complaints about Rebel Yell. One it was a tad jostly (if thats a word) at the bottom of the larger hills. It wasnt enough to ruin my ride certainly, but it was there. Also, the racing element wasnt nearly as good as the one I experienced on Lightning Racer a year before (trains finished quite a few seconds between each other). Still, I definitely like racing coasters better than the average coaster. Though often overshadowed by the newer steel coasters and two other wooden coasters, Rebel Yell still is a worthy ride and one of my favorites. Rebel Yell is a solid &quot;racing&quot; coaster that succeeds in some areas but lags in others. First off, the coasters is in dire need of a fresh coat of paint as almost all of the paint has chipped off and the coaster's black speckled track would be the envy of Cruella de Vil. While the two sides often dispatch at the same time, the racing element is sort of tarnished by the fact that one side usually reaches the top of the lift hill earlier than the other and easily wins. Beyond this, Rebel Yell is a decent wooden coaster. The long out-and-back layout has some good moments of air-time, especially on the turnaround, and maintains its speed quite well. Also, the coaster is reasonably smooth and only has a little jackhammering at the bottom of a few drops. Do not forget to give the Rebel Yell a ride or two while at the park since it still has some pep in its tracks. The trains are close enough in spots that you can talk some smack to the other side, but the racing part wasnt terribly synchronized. One train often finished significantly ahead of the other, which detracts from the racing element. There is some good airtime and some dull spots. A pretty good ride. My "10" rating might be inflated for sentimental reasons--it was my first "big" coaster and I must have ridden it 1000 times as a kid. 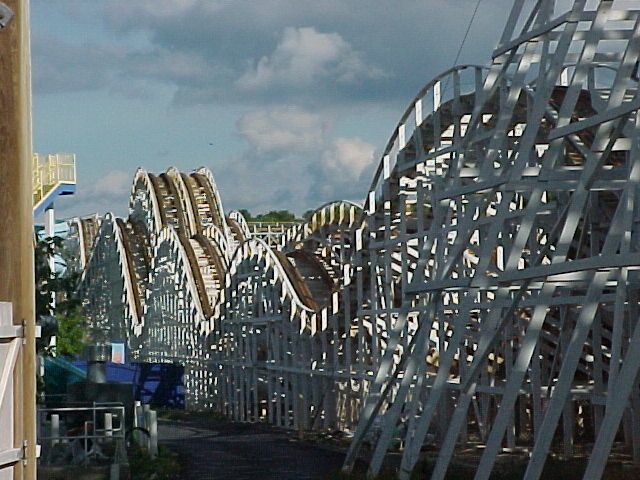 I havent visited in several years so I cant speak for its current operating condition, but in its prime it always had great speed and airtime. Edit-On July 15th I got one of the roughest rides ever on this in the backseat going forwards. Other seats werent all that rough. I felt backwards deserved more of a 4 though. It just didnt seem as fun and the first drop didnt seem as nice. I think the best drop on this is the one after the turn around as it has the most air. I didnt get a chance to ride this one backwards, but forwards was still a good time. Rebel Yell is one of those coasters that is just plain fun. While I had hoped for more air, I still got some floaters here and there and possibly one spot of ejector air. For such an old woodie, the speed on Rebel Yell was great, and it didnt let up at all! Great fun, especially if you are a fan of lots of hills. Oh hell yeah. Up and down and up and down the entire time. Like a hyper coaster on wood. But you know the lack of intensity in hyper coasters cuz theyre so smooth and relaxing. Thats not how it is on a wooden coaster. You go rumbling up and down and up and down like and out of control hyper coaster ride. Backwards is totally awesome and you get lots of airtime. Riding in the backseat of this coaster got me out of my seat real high. A classic. Backwards is awesome with great airtime through the whole ride. Can you believe this was my first roller coaster that went up over 50 feet so i have loved this coater a while because this ride got me started on coasters.